There are 31,102 verses in the Geneva Bible, including The Apocrypha. There are 550 marked passages which add up to around 975-1100 marked verses depending on how carefully you count. "While other English translations failed to capture the hearts of the reading public, the Geneva Bible was instantly popular. Between 1560 and 1644 at least 144 editions appeared. For forty years after the publication of the King James Bible, the Geneva Bible continued to be the Bible of the home. Oliver Cromwell used extracts from the Geneva Bible for his Soldier's Pocket Bible which he issued to the army." Our charts are based on marked passages in Oxford's copy and make no reference to verses at all. Since one mark can cover three verses but may refer to a single item in the Shakespearean canon, this can inflate the headline figures unnecessarily. Like David Kathman, we have classified the marks as ranges, exactly as they appear in the Bible, rather than producing a secondary list of marked verses. If a single reference occurs in a marked range, it counts as one match. If there are two references, this counts as two matches but still only one mark. If there are eight verses covered by one marked passage (or one series of underlinings), that counts as eight matches but still only one mark. That's why our marks total is 550. We think this is the best way of analysing both the interests of the annotators and those of the playwright. Especially since some verses are marked twice, in different ways. The method of counting makes little difference to our probability calculations (or to Stritmatter's). We do not intend to perform probability calculations based on the number of verses. Our calculations ignore the contentious debate surrounding how many verses are quotable—the source of the wildly improbable calculations in Stritmatter's Appendix C—and concentrate entirely on the relationship between marked and unmarked references. The importance of the issue lies in the definition it adds to our views of the annotators. Where there are two marks within a single verse, our method admits the possibility they might be made by two different people. Stritmatter's method of counting handily eliminates this dichotomy. By separating and classifying the types of mark, then looking at where they fall, relative to each other, we have formed the conclusion that there are at least three principle annotators. De Vere may not even be among them. The first task in looking at any conclusions drawn from the marks is to examine who made them, especially in the light of the claim that all, or nearly all of the marks were made by the first Edward, Earl of Oxford. Edward De Vere has a good claim to ownership of the Bible and appears to have acquired it from new, judging by a receipt in the papers of the De Vere estate. Let's accept that without further reference. However, there may have been scores of other owners before the Folger Library acquired it in the 1920's. Any of these earlier custodians could have made the marks. If we categorise the differing styles of mark and start to think about why they were made, the Earl's claim to have made all of them is severely weakened by probability, not strengthened. The differing inks aren't much help. Stritmatter offered to fund forensic examination of the inks used to make these marks but the Folger wouldn't comply. This type of chromatography is not an exact science. Analysis allows inks to be placed into half-century timebands at best. Even if the tests had been carried out, they could not have been conclusive on the matter of ownership. In the absence of scientific tests, Stritmatter goes ahead and concludes anyway, possibly as a result of an experiment with Occam's Razor. He usually needs no second invitation to leap to any conclusion favourable to his argument. His conclusion (and he comes to it right at the beginning of his work) is that it is sensible to assume they are all made by the book's first owner, the Earl of Oxford. He admits one mark is an outlier but makes no further reference to the possibility that there might be more than one annotator. There are observable consistencies within the different types of mark. Classifying the marks immediately highlights three different underlining styles, red underlining, black underlining and red underlining of chapter numbers. These three categories account for 73% of the marks in the Bible. The interests of these three annotators are neither random nor shared. The difference in interests is most marked between the black underliner and the red underliner. This chart shows each category of mark with more than five constituents. It demonstrates a clear difference of interest between the three most prolific annotators. Whilst there is no compelling reason to suppose that these are three different people, the obvious fact that these represent developed, but differing interests in differing sections of the Bible does not help the idea that they were all made by De Vere. The minor annotators do not help De Vere's case either. Isaiah has six different annotators at work, Job five, and four other books have four differing types of mark. One person could well be responsible for all these marks if their interests and writing equipment changed over a long lifetime. A single person could have selected different marks to indicate different categories of interest. But in an evidential light, a single annotator looks very improbable. We can't, however, leave it there, even though Stritmatter never came this far. A different view of the same data highlights where the interests of the three main annotators overlap. Transparent columns illustrate this with darker areas where colours overlap. None of the most marked books contain the work of all three annotators. This might look helpful to the idea of one annotator using different methods in different books. What is most strongly illustrated, however, is the difficulty of coming to any conclusions on the identity of the penman. It is De Vere's bible but we believe that the strongest explanation, given that the marks are different AND indicate different interests, is that we are looking at the work of three different individual annotators. The conclusion that they are the same person is neither supported by the topography of the marks nor, in the absence of chromatography, by visual examination . The coloured inks have faded differentially. Again, the most likely reason is a contra-indicator—the result of differing amounts of elapsed time since they were made. A further strong contra-indicator lies in the handwritten marks, which do not strongly resemble De Vere's hand. De Vere left lots of handwriting. Stritmatter chooses Mark Anderson as a witness to his own handwriting analysis, a bit like Hyde choosing Jekyll as a character witness. Tom Veal reviewed the handwriting claims made by Stritmatter and Anderson soon after the thesis was published on Tom's Stromata site. We also find the idea of one source for all the handwriting extremely unlikely. One of many other characteristics which fail to coincide with the handwriting in De Vere's letters are the letter forms which resemble printing. These were made by an extremely accomplished penman, almost certainly using an oblique steel nib, unlikely to have been available to De Vere, and stand far out from the rest of the work. The penmanship of the underlining work also exhibits variety. The red underlinings have a consistency which is compatible with the use of a steel-nibbed pen, quite different from the red marks underlining chapter numbers. 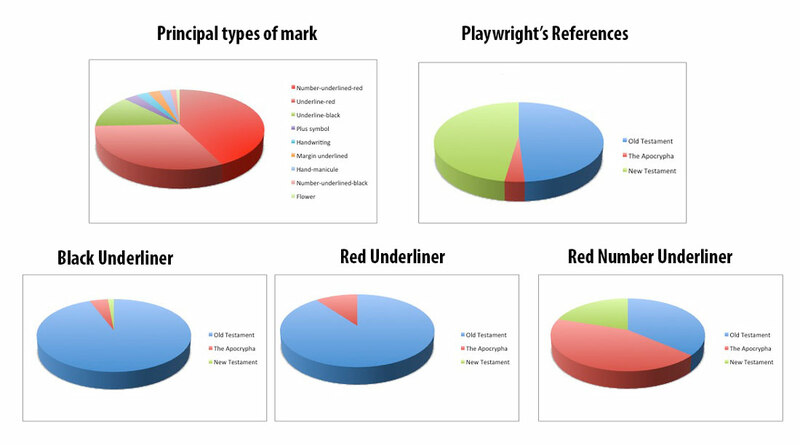 The red underliner is responsible for 25% of the marks and his (or her) interest is concentrated in just five books. These are the neatest marks and their bright red ink and consistent stroke width suggest they were made with a steel-nibbed pen, long after De Vere's death. To sustain Stritmatter's thesis, we should be able to find a period in the playwright's life or work in which the themes of these five books are strongly reflected in the work. There should be a concentration of 'Diagnostic' pointers which support the idea that the playwright and the annotator are drawn to similar passages and similar verses. Claims of this type are openly made by Stritmatter's followers. Frequently. Yet when dealing with the red underliner, no such relationship can be found. Rather than a playwright's scattered aide memoire, these detailed underlinings are concentrated in short passages, strongly resembling the marks a cleric might make preparing a sermon on the basis of a particular text. What we see here are four tight clusters, representing sermon-length passages, with the important parts selectively underlined, like presenter's notes in Powerpoint. Whilst the Folger Geneva Bible is unlikely to have served as a pulpit bible never having had the status of an authorised version, we think it much more likely that the underlinings were made by someone preparing something to be spoken aloud, such as a lecture or a sermon. Notes for a play could perhaps look like this but the level of detail and concentration should, in that case, make it easy to identify which play featured the passages. Yet, when looked at in detail, the clusters in 1 Samuel do not produce any overlap with the playwright's references. "for them that honor me, I will honor, and they that despise me, shall be despised.". then finishing with a terrifying scowl at the sinners cowering in the back rows. No names. You know who you are. Note how Stritmatter's extra references, the blue columns, are always added to the red columns denoting the marked verses, increasing his favourable matches, creating new 'diagnostics' without increasing the size of the overall dataset. Kingship is a major feature of 1 and 2 Samuel which deal with the transition from Saul's reign to that of David, selected directly by God. In subsequent books, 1 Kings is also heavily marked by the red underliner and, two books later, so is 2 Chronicles. They deal with the establishment of Israel and its history until the destruction of Jerusalem. Then his interest evaporates until the apocryphal book 2 Esdras, the Jewish Apocalypse. Like the Florentine painter of the results of good and bad government, the red underliner is concerned with stable institutions, a rightful king, and a sensible compact with God. These themes interested the author of the history plays. 1 Samuel ranks as fifteenth-most-referenced book and those references are most frequently made to the history plays, or plays about kingship such as Macbeth or The Winter's Tale. Yet only three of the playwright's 50 favourite references figure in the red underliner's favourite books. That's a meagre 6%, well within the threshold of coincidence. Studying these passages doesn't seem a likely pastime for Edward De Vere unless we believe, as do some Oxfordians, that De Vere had a claim on the throne. Still, the Earl was an occasional (though incompetent and lightweight) meddler in plots against the crown. So in this, his most annotated book, on Shakespeare's favourite subject, we should surely be looking for at least 50% of the marked verses to be matched with references in the plays. If we admit the marks were made by human beings, the sad truth is that a ratio of one in eleven doesn't come close to suggesting anything non random. The nature of statehood - The Divine Right of Kings - while always relevant to the English Succession, was an issue which came to prominence in English politics during The Civil War period and these books must have been popular with royalist clergy. Could the red underliner have been a Cavalier in Charles II's army? If so, there's another De Vere in the frame. Aubrey De Vere, the 20th and last De Vere to bear the title Earl of Oxford, was a dyed in the wool Royalist, a protestant who eventually turned his coat for William 1 after refusing service on the grounds that he would not appoint Catholics to public positions. A better candidate for annotator perhaps, than his not so illustrious ancestor. Attribute any of the the three major categories of underlining to a cleric or a descendant and, even before detailed analysis begins, very little is left to link the marks with the plays. Despite the claims of Aubrey De Vere, we feel a clergyman is the most likely source of the red underlining marks. Of course, there is no proof supporting this theory but, since there is no proof that De Vere made the marks either, it is fair to ask whether someone producing a PhD on just the markings in this Bible might not have spent some time considering the claims of a man of the cloth as an alternative annotator. The black underliner was partial to the prophets, especially Isaiah and Hosea. 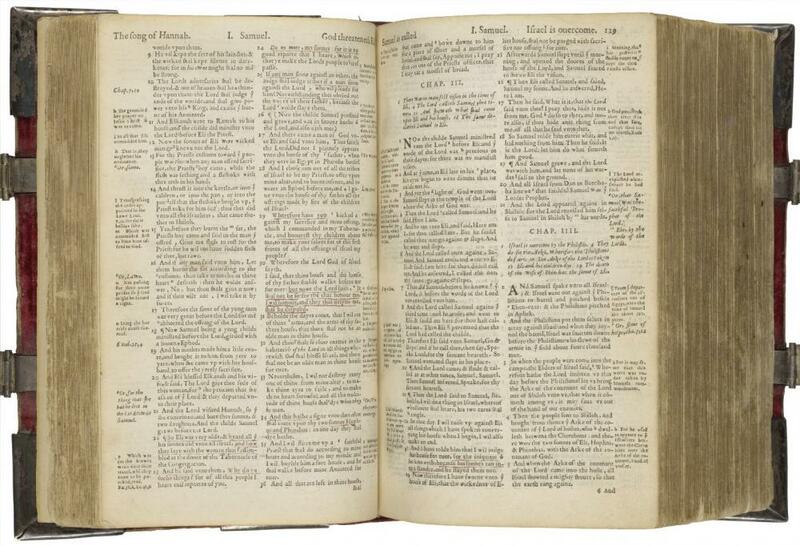 The Apocryphal book Hosea is only of moderate interest to the playwright with only one verse containing a match. 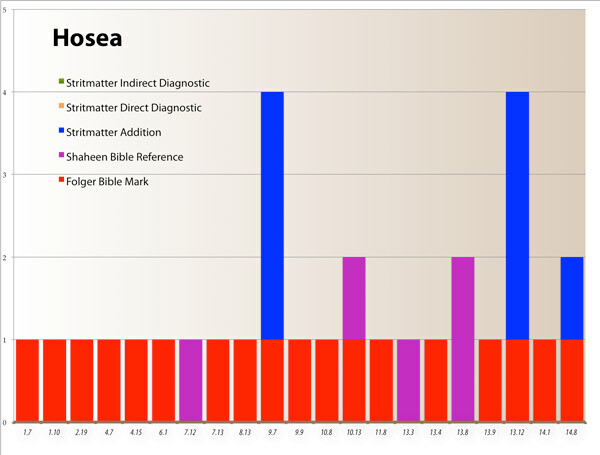 Hosea does boast seven Stritmatter additions, however, which lifts the number of matches to eight and in a small book, this makes a big difference. Not big enough, however, as we shall see. Nor is there much overlap of interest in the chapter and verse of Isaiah. We can see that Stritmatter has identified two of the playwright's favourite passages in Isaiah as 'Direct Diagnostics'. Neither is marked by an annotator and he ignored a third heavily referenced passage at 51:8. There are six matches in Isaiah, a ratio of 1:24, matched:unmatched, after the additions are included. Nothing suggests a coinciding pattern of interest between annotators and the playwright. Indeed, the marks and references are clustered in different parts of the book. The red number underliner makes small, thick, occasionally smudgy marks. This person is the most prolific annotator and has the widest interest in the Bible as a whole. Yet he has fewest correspondences with the playwright, principally because his main interests seem to lie in The Apocrypha and Revelations. A hot gospeller, perhaps. It seems far more likely that these three annotators, with differing inks, pens and interests were three different people rather than a single Earl with radically changing ideas. There seems little chance of identifying the individual annotators but it would have taken a remarkable aristocrat (and a pious one) to have made them all. All of these inferences are speculation. In Stritmatter's own terms, nothing here says that Shakespeare didn't buy the Bible in 1611, making all the marks himself as research for an unfinished play on witchcraft, now lost. Nothing definitively says De Vere didn't make all of the marks (though we now think that fantastically improbable), nor can a case for his authorship be argued from this data either way, however you interpret it. As evidence of anything, the marks in the Folger Bible fall well short of supporting any of the Oxfordian ambitions for them. But if you unmuzzle Gods of probability, they'll always find something to say. What they say here is that if you want to use the evidence of the marks to claim that the annotator of the Bible was marking passages referenced in Shakespeare's plays in a way that suggests he was the author, you are whistling in the wind. Nothing in this analysis, or the earlier work of David Kathman and Tom Veal, suggests that the playwright and the annotators interests coincide, even slightly. At best, this proposition never amounted to more than a sixpenny bellows trying to blow up a few dim embers and a bit of Oxfordian smoke into the Faculty windpipe. It failed. And Oxfordian credibility died with it. The following tables list all the marks in the Folger based on David Kathman's work for his article on The Shakespeare Authorship site. 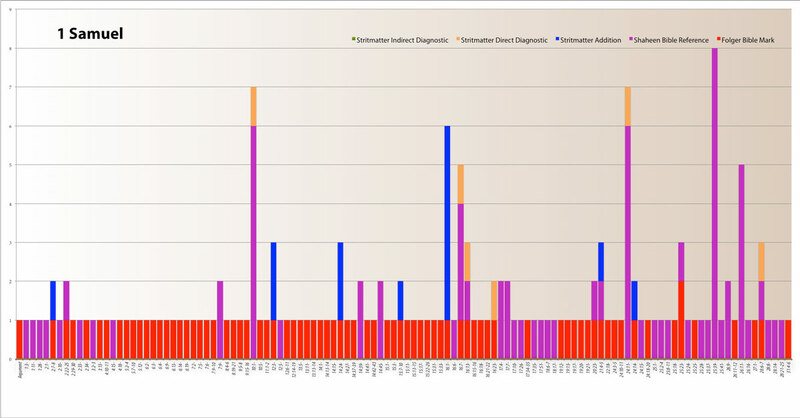 The numbers include Stritmatter's additions and diagnostics. The tables show the detailed view of the lack of correspondence in interests at section and book level, this time classified by the type of mark. This further banjaxes the proposition. It shows that the markers display different areas of interest. This is important because Stritmatter is trying to relate the marks to De Vere by assuming The Earl made them all and by claiming that their distribution suggest that Shakespeare made them. Where is there any support for this? By his own logic, these are at least three different people, not a single Earl. With the axes turned, the lack of correspondence in interest between the annotators and the playwright is even more apparent. Any faint idea that two or three books might help the proposition out is destroyed by more analysis which proves that even in books with promising amounts of marks and references, there is still no suggestive overlap.